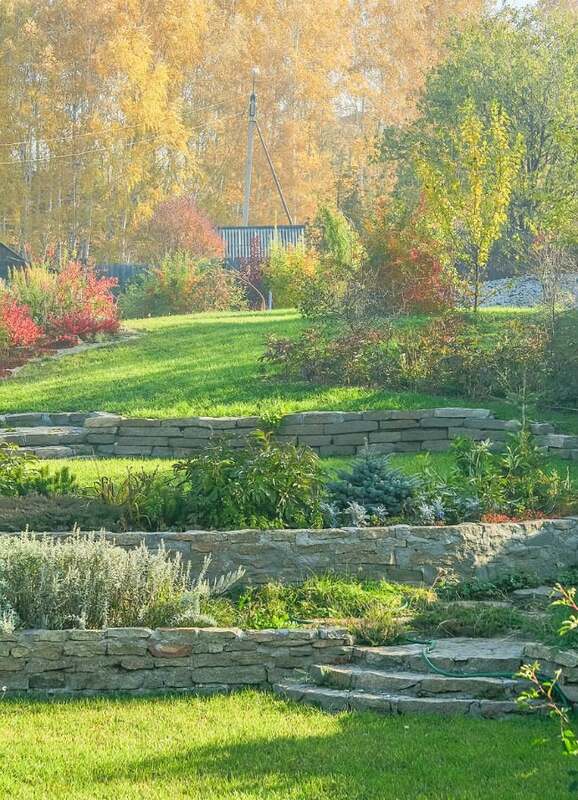 If you live in hilly terrain, learn about the landscaping trick that can counteract soil erosion and help beautify your backyard all at once—and how easy it can be to DIY with the right materials. Reducing soil erosion, turning steep slopes into terraced backdrops, creating focal points in the landscape—retaining walls serve many purposes. Indeed, they are some of the most common ways to correct problems caused by hilly areas! Well-built retaining walls transform unworkable inclines into usable outdoor space for the garden. Despite their simple appearance, though, these walls require a good deal of planning—sometimes professional engineering—to keep their shape. Soil is heavy, especially when soaking wet from a recent rainstorm, so a basic retaining wall (four feet tall and 15 feet long) potentially has to support up to 20 tons of soil pressure. With every additional foot of height, the pressure of the soil increases substantially. Miscalculate your construction plans, and you could end up with a weak wall that risks bulging or, worse, collapsing altogether. For just this reason, retaining walls taller than four feet should be designed and constructed by the pros. Shorter retaining walls, however, can be constructed by enthusiastic do-it-yourselfers equipped with some basic construction knowledge. Does that sound like you? 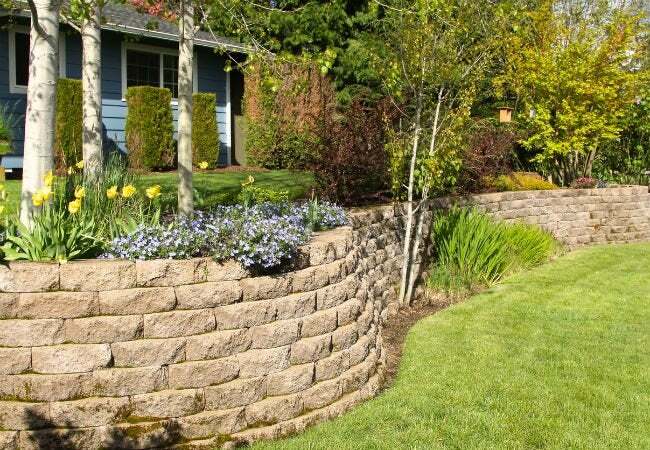 If you’re looking to get your hands dirty and enhance your landscape with a retaining wall, these guidelines for building a retaining wall will help you get off to a good start. DON’T forget to check with the authorities. A retaining wall’s effect on the natural flow of water could impact your neighbors, so some communities require homeowners to obtain a permit before construction commences. You may have to submit plans for your wall and schedule a property inspection to ensure that building a retaining wall won’t create drainage problems. While you’re at it, do also place a call DigSafe (811), a nationwide service that will notify local utility companies that you plan to dig. These can determine whether their buried lines will be in the way and mark their exact locations. DO choose a material you can easily work with. Retaining walls can be constructed using a variety of materials, from poured concrete and large timbers to natural stones, even bricks. 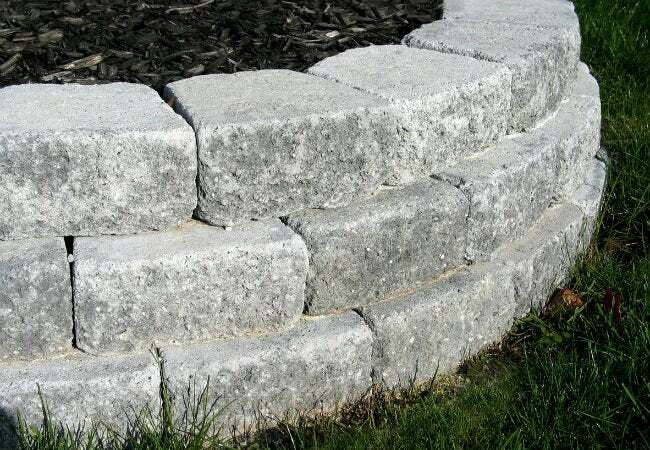 For DIY purposes, opt for manufactured blocks that are designed specifically for building retaining walls; a locking flange along the bottom edge creates a secure attachment between rows. These blocks (available in gray and earthy tones in smooth or textured faces, like these at The Home Depot) can be found at virtually any home improvement store and many garden centers as well. DO start with a good foundation. Your retaining wall will only be as strong its support system. For a stacked-block retaining wall that’s no higher than four feet, a trench filled with three inches of crushed rock will help keep the wall from shifting and settling. The exact depth of the trench depends on the proposed height of the wall, but follow this rule of thumb: Dig a trench to be an eighth of the wall plus three inches. For example, if you want the finished height of your retaining wall to be three feet (36 inches) tall, you’d need to dig the trench eight inches deep to accommodate three inches of crushed rock and about five inches (or an eighth of the visible retaining wall) to start the wall below grade. DON’T lay blocks on an unlevel surface. The first course (or row of blocks) sets the stage for the rest of the wall, so it’s vital that you make it perfectly level. If it isn’t, subsequent rows won’t be level either, resulting in a retaining wall that’s lopsided and unattractive. Use a four-foot, or longer, carpenter’s level to ensure that the gravel layer below the first course of blocks is level before you start setting the blocks. Any discrepancies here will show up higher in the wall. DO stack blocks at a slight backward slope. A wall that leans into the soil it retains is less likely to be pushed outward by soil pressure than a plain-old vertical wall. 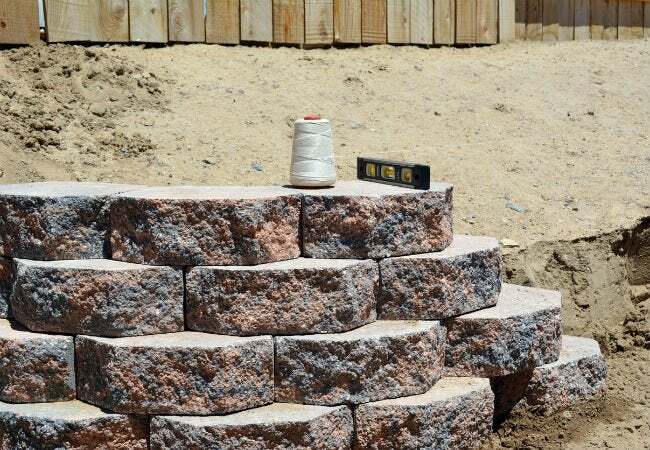 Design and build your retaining wall to slope at a minimum rate of one inch for every one-foot of rise (height). Fortunately, working with retaining wall blocks makes it incredibly easy to achieve this “step-back” construction! The locking flange on the bottom edge of every block guides it to click into position slightly behind the lower block, preventing the top blocks from being pushed outward. DON’T forget to allow for drainage. Groundwater is the natural enemy of retaining walls. When it saturates clay-type soils, they swell and put excessive pressure on the backside of the wall. To avoid failure, make drainage provisions at the same time as you go about building the retaining wall. Backfilling the space behind the blocks with crushed stone and then installing a flexible perforated drainpipe, also called “drain tile,” at the base of the wall could create the necessary escape route for groundwater. The perforated pipe will carry groundwater to each end of the wall where it can drain harmlessly away. The ends of the drainpipe should then exit on each end of the wall, and you may cover them with crushed stone to camouflage their appearance. After your drainpipe is in place, you should backfill the rest of the space behind the blocks with either sand or pea gravel—either will allow water to filter through to the drainpipe at the base of the wall. For the best results, backfill with a few inches of the material after laying each course of blocks, and use a hand tamper to compact the material. By tamping the backfill every six inches or so, you’ll ensure that it is packed tightly, which will provide additional support from the pressure of the soil behind the wall. DON’T opt for a single tall wall if you can construct multiple tiered walls. While retaining walls taller than four feet should be engineered by professionals, you may be able to DIY a solution for a tall slope by creating two or more shorter “tiered” retaining walls as opposed to a single tall wall. A series of short walls adds visual texture, and each individual wall will support less soil weight, ensuring that they’re less likely to fail. When building a tiered set of retaining walls, position the higher wall behind the lower wall at twice the distance as the height of the lower wall. For example, if the lower wall is three-feet high, the higher wall should be set back at least six feet from the lower one. This keeps the higher one from creating pressure on the lower one.